During the last two decades many of the established perspectives in Anglo-American philosophy and social science have been subjected to probing criticism. The philosophical approach developed by the later Wittgenstein, Austin and others has been questioned from many sides; and the erstwhile predominance of functionalism in the social sciences has given way to a plurality of methodological positions. Undoubtedly these developments have been unsettling, but their effects were not merely destructive: they prepared the way for a broadening of intellectual horizons, a relaxation of rigid boundaries between different disciplines and different traditions of thought. It is within this historical context that Jürgen Habermas has assumed an extraordinary stature. As the leading social thinker in Germany today, Habermas has elaborated a theoretical orientation which is relevant to a wide range of disciplines, from politics and sociology to philosophy, psychology and linguistics. His work reveals an astonishing grasp of intellectual traditions and a wealth of original ideas. 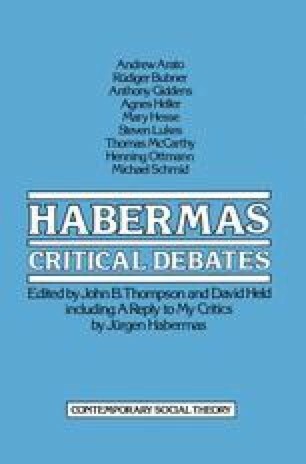 Amid the turbulence which prevails in the humanities, Habermas stands out as a thinker of tremendous scope and vision.